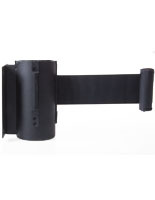 This gray stanchion belt is compatible with any crowd control selection from our QueuePole.Deluxe line. 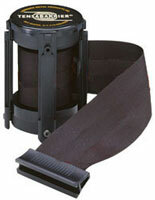 Replace a worn stanchion belt for barrier systems instead of buying a whole new system, and save. 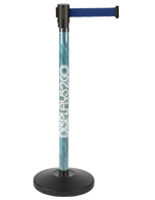 Instantly change the decor for an event by updating a current system with a stanchion belt from this site/collection. 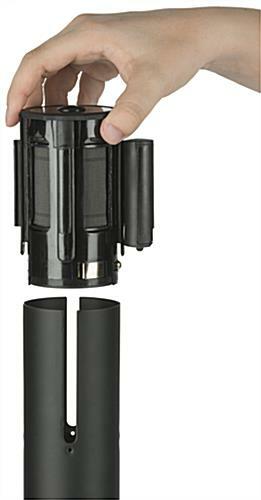 The black belt post is encased in a durable plastic cartridge that holds up with frequent use and lots of visitors at events. 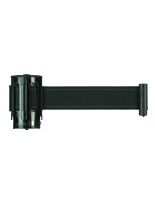 Easy to set up, this belt, crowd barrier accessory, has a 4-way adapater. To set up, just take out the old cartridge with a screwdriver and insert the super-long 9.5' replacement. Note to Customer: This replacement belt for QueuePole.Deluxe Stanchions will not work with supplies from another line or site. 3.5" x 4.5" x 3.1"